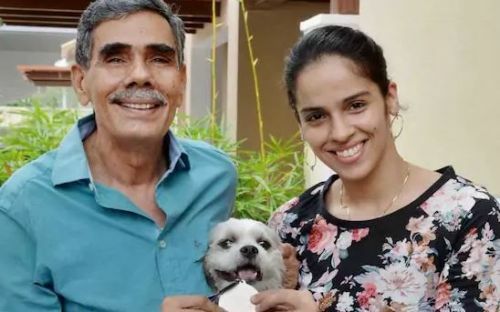 Saina Nehwal's father's name has been omitted from the Indian contingent. Twenty-one names have been omitted from the Indian Olympic Association’s (IOA) list of non-athletes as a part of the contingent for the upcoming Commonwealth Games in Australia. Shooter Heena Sidhu’s husband Ronak Pandit, who is the high-performance director of the Indian pistol and rifle team, along with shuttlers PV Sindhu, and Saina Nehwal’s mother and father respectively are among those who have been dropped from the IOA’s list. Ronak’s exclusion is one that may raise a few eyebrows for the Indian shooting team as gun permit, that is an issued for the CWG organizing committee, has been issued in his name as he was given the team manager’s responsibility. The authorization issued in Pandit’s name by the hosts will be required to carry the weapons in and out of the Games and his absence may be the cause of a few hassles to the Indian team. NRAI will ensure he is there its our team which is India’s team which is SAI/GOI’s team which is IOA’s team so who needs other countries to compete with, how will the gun permits be transferred? What will our team use to shoot?. No one seems to care or understand. This is not the first time that Pandit has been disregarded. Since the time of the 2012 London Olympics, Pandit and Heena have had to deal with disappointments when it came to getting funding from the government. At the London Olympics, the couple was an unknown quantity, and the money authorized to them came only after the Games. The duo was snubbed in a similar fashion before the 2016 Rio Olympics as the Ministry officials opposed to the decision of Pandit being selected as Heena’s coach. IOA president, Narinder Dhruv Batra disparaged the Sports Ministry for bringing up the issue of family members travelling as part of the contingent. Batra openly said that the Ministry should reveal the names of its officials who will be in Gold Coast. “Extra officials are the requirement of every team. A badminton player needs a coach, physio and masseur. These are the requirements. Extra officials are not going at government cost. I don’t know why the government is making so much noise if the federations are paying for them,” Batra said. “If an athlete is taking his/her parents as manager or mentor, I’m sorry; I have no authority to stop them..." the IOA President continued. If the physician’s name is struck off and an athlete falls ill, what will we do? People will blame IOA. We are sending two doctors, one orthopaedic and one physician. If the physician is dropped, I have no justification for that. If you think its war-path with the Ministry, let it be,” he said. However, in a post on social media, Narinder Dhruv Batra proposed that all was not lost after a discussion with Sports Minister Rajyavardhan Singh Rathore over the telephone. The Indian athletes are going out there in Australia to bring laurels for their country. Hence, it naturally becomes the duty of the government to ensure their well being and safety, both physical and mental. Dropping physicians, as was alleged, is something that could backfire during the games. Also, striking off the names of family members of the athletes could also have a detrimental effect. Parents or spouses could give the athletes the required mental strength to perform well during the competition.